One thing you learn in architecture school is that the site should influence the architecture. Actually, this may be the most important thing one learns in architecture school. This is why architects, in general, frown upon cookie-cutter homes plopped down on a site here or a site there with little thought given to where the sun is in relation to which rooms are occupied at what time of day, or what the neighbors can see, or what you can see of the neighbors. In contrast, the organizational concept of the Roberts Avenue Residence was very much influenced by it’s context. 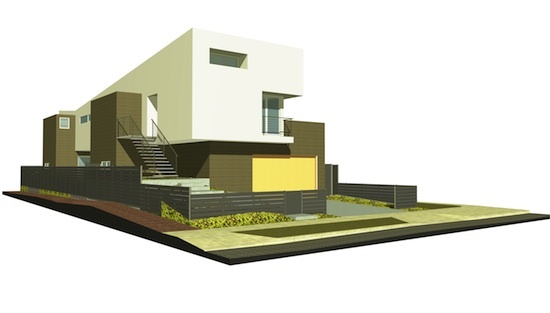 The site for this project is located in Culver City, immediately north of Syd Kronenthal Park. Living in a home this close to a public park has its benefits and its challenges. 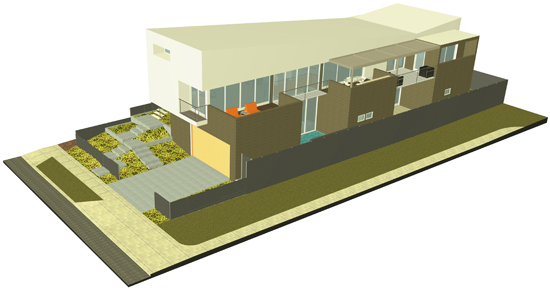 Our charge was to design a two-story modern home for a family of four, deal with the challenges of the park, take advantage of its assets, while keeping in mind the house’s appeal to future buyers. Designing for the “Pros” of this list is the easy part. Our job as architects is to ensure we protect the “Pros” with our design, while properly addressing the “Cons”. The ground floor is where the park activity and noise is occurring. But, this noise can be mitigated at the ground level by planting a landscape buffer. The upper floor of the house, meanwhile, is exposed to the park. But, in turn, the park, and, more importantly, the views to the Baldwin Hills beyond the park, are visible from the upper floor. So, the ground floor is the protected, sheltered, and tranquil area of the site, while the upper floor is exposed, open, and visible. It made sense to us, then, to locate the kids’ bedrooms on the ground floor and the living spaces and master suite on the upper floor. The bedrooms are buffered from the park noise while the living spaces and master bedroom take advantage of the views. Running with the idea of the ground floor being protected and tranquil, each ground floor bedroom opens onto its own patio space. These private patios are meant to create a peaceful, relaxing indoor/outdoor bedroom environment. The living spaces, as well as the master bedroom on the upper floor, open onto their own decks facing the park. Large sliding glass doors track back, making the grand interior spaces feel even larger. These upper decks are prime spots to soak up some California sun while gazing towards the Baldwin HIlls.